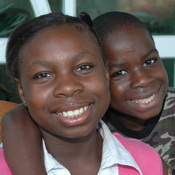 Many youth in our program are waiting to be adopted right now. These are youth with resilient spirits who want a chance to live their dreams as teachers, lawyers, carpenters, and artists. One wants to be a minister. Another wants to become a veterinarian. Most have experienced multiple disruptions in their lives—moving from foster home to foster home. Yet they still carry hope. With guidance and encouragement from caring parents, they can change the course of their lives. Being an adoptive parent takes more than love. It takes time, energy, patience, and perseverance. You have to be seriously committed to making a change in a youth’s life. Though parenting a teenager can be challenging, it is also rewarding. Your life will be changed in ways you never imagined. Once they know someone truly believes in them, they open up and begin to blossom. The first step is to receive training and licensure through a state accredited licensing agency. An application process and home study will be conducted to make sure that you are prepared to accept an adoptive child. Keep in mind that Under One Sky is not a licensing agency. We cannot provide the license required to become a foster parent or to adopt a child from the North Carolina foster care system. However, we can help you find an agency that is right for you. To learn more about the youth in our program who are waiting for adoptive families, contact our Youth Services Director, Karen Noel. She will be glad to talk with you about the process and get you started on the right track. 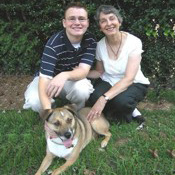 Beverly and Brandon Nivens with Brandon’s dog, Jake. 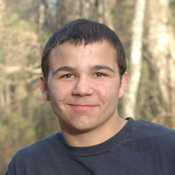 Brandon, a youth at Under One Sky, was adopted out of foster care by Beverly in 2007 when he was 16 years old.